Thus, ahead of tonight’s split-squad preseason games, here are a few Things That Make You Go Hmmm. 1. 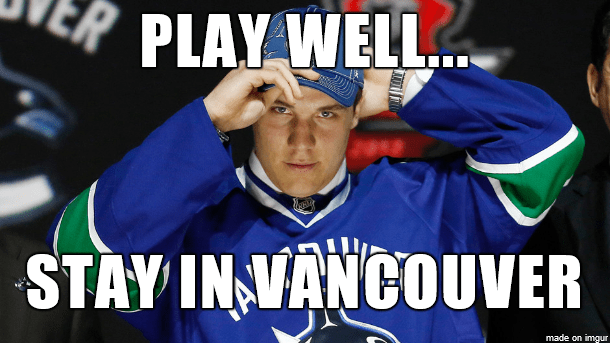 Will Bo Horvat make the team? I asked a similar question during training camp last year which speaks to the high hopes that I (along with many other Canucks fans) have for the 2013 first-round draft pick. We’re all eager to see what Horvat can do at the NHL level as a good start to his career would help us erase the memory of Cory Schneider. At least a little. It looks like coach Willie Desjardins will give Horvat every opportunity to make the team. In training camp, he played on a line with Shawn Matthias and newcomer Derek Dorsett and in tonight’s game, he’ll center Dorsett and Mike Zalewski. Bottom line: he’ll have a good chance to make the opening night roster, or at least stay with the team as the 13th or 14th forward. I predict that he starts on opening night centering the 4th line. Then, the pressure will be on to make a strong impression in his first 9 games and force the team to keep him with the big club as opposed to sending him back to junior. It’s a situation worth watching, for sure. GM Jim Benning has gone on the record saying that he likes to be very patient with prospects. However, Horvat won’t gain much for doing another year in junior (and he’s not old enough to play in Utica). He’ll likely learn more by staying in Vancouver and hanging around the veterans, even if he’s a healthy scratch on many nights. 2. What will the crowds be like at Rogers Arena this season? It’s common knowledge that the Canucks had their sellout streak snapped last season as fans grew tired of the boring style of play and lack of excitement. At the start of last season, I actually thought that there would be great interest in the team with the new head coach and all of the eastern teams coming through town. Boy, was I wrong. Don’t get me wrong, I witnessed some exciting moments. Like Jason Garrison and Dan Hamhuis getting their signals crossed before putting the puck off of Roberto Luongo into their own net. Or how about the vaunted New York Islanders scoring seven third-period goals to beat the Canucks 7-4? And of course the Heritage Classic aka the straw that broke Luongo’s back. Willie Desjardins has been preaching a more aggressive and offensive style. As well, there seems to be interest in the players like Miller, Vrbata, and Bonino. I think that early crowds will be decent especially if the Canucks are winning. The true proof in the proverbial pudding will be in January when teams like the Islanders, Flames, and Sabres all come to town. 3. Was it really THAT bad under Torts last year? Just how bad was it in the locker room last year? Alex Burrows claims that he didn’t have a meaningful conversation with John Tortorella until half-way through the season. Players in training camp this year are acting as if they’ve been given a new lease on life, using words like “respected”, “calm”, “relaxed”, and “listened to”. It’s been said that it took five or six years for Alain Vigneault to lose the room. It probably took John Tortorella five or six months. It will be interesting to see what type of team Willie Desjardins produces. One thing’s for certain: it can’t be any worse – or more dysfunctional – than last year’s version. That’s a good point. I was giving Torts the benefit of the doubt haha. Sellout streak still exists. Get facts straight thx.